Step out of Dubai with an excursion to Sheikh Zayed Grand Mosque Center in Abu Dhabi--about 1h 55 min away. The adventure continues: admire the landmark architecture of Burj Khalifa, cool off at Wild Wadi Waterpark, take an in-depth tour of Sheikh Saeed al-Maktoum's House, and browse the different shops at The Dubai Mall. To find other places to visit, more things to do, ratings, and more tourist information, you can read our Dubai day trip planning app . Washington DC, USA to Dubai is an approximately 18-hour combination of subway, bus, and flight. You can also do a combination of subway, bus, flight, and shuttle; or fly. The time zone changes from Eastern Standard Time to Gulf Standard Time, which is usually a 9 hour difference. Traveling from Washington DC in February, things will get much warmer in Dubai: highs are around 78°F and lows about 63°F. 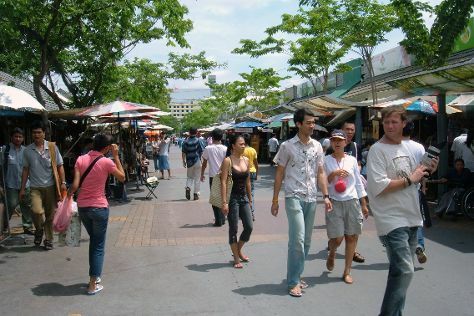 Finish your sightseeing early on the 18th (Mon) to allow enough time to travel to Bangkok. Change things up with these side-trips from Bangkok: Ayutthaya (Wat Chaiwatthanaram, Wat Phra Sri Sanphet, & more). There's still lots to do: step into the grandiose world of The Grand Palace, look for all kinds of wild species at SEA LIFE Bangkok Ocean World, contemplate in the serene atmosphere at Wat Saket, and buy something for everyone on your list at Siam Paragon. To find photos, reviews, where to stay, and other tourist information, you can read our Bangkok travel itinerary planner . Traveling by combination of flight and train from Dubai to Bangkok takes 10 hours. Alternatively, you can do a combination of bus, flight, and train. The time zone difference moving from Gulf Standard Time to Indochina Time is 3 hours. Prepare for somewhat warmer weather when traveling from Dubai in February: high temperatures in Bangkok hover around 91°F and lows are around 75°F. Wrap up your sightseeing on the 26th (Tue) early enough to travel back home.